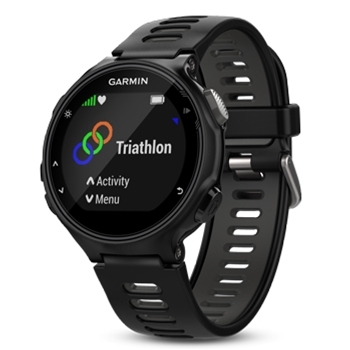 The Garmin Forerunner 735XT Tri-Bundle is designed for Tri-Athletes that want and expect the most from a Running watch. Within the 735XT is a high sensitivity GPS Glonass receiver that lets you know where you are at any time, and can store up to 80 hours of activity. Built in heart rate provides you with accurate monitoring without being tethered to a heart rate strap around your chest, run freer with a wrist based heart monitor. Regardless of what type of workout you do, change modes with ease with the multisport feature whether going between strength training, swimming, biking, running, even skiing and paddle sports with a push of a button. Keep track of steps taken, calories burned, heart zone as well as beats per minute. Take advantage of Garmin connect to automatically sync data from your wrist to your PC. This 735XT is not just another running watch. Advanced dynamics for swimming, biking and running, provides data for ground contact time balance, stride length, vertical ratio and much more when paired with the included HRM-Tri Monitor. Customize the workouts you create with the free download from Garmin Connect, then review and share your successes with people you know to keep you motivated. The battery life varies and is dependent on your activity- 24 hours in Ultra Trac mode, 14 hours in GPS and Optical HR, and as much as 11 days in watch mode. The included charging data clip keeps the Forerunner ready to go. Shock resistant adds to the ruggedness of the 735XT and is also water rated to 5 ATM, so dive in and let the swim metrics track pace, stroke, distance. This smart watch even identifies the type of swim stroke. Tracking performance during the workout is important, but so is the recovery process, and when you push your body as hard as you can go, seeing what happens as you get acclimated back to normal. 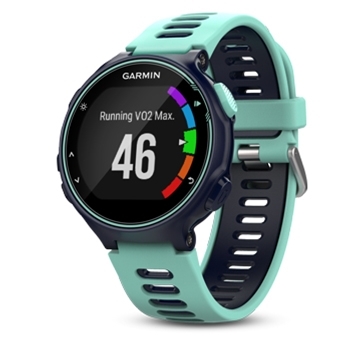 VO2 max estimate, lactate threshold, race predictor and recovery advisor, will be utilized by runners and Forerunner 735XT even measures the impact of aerobic activity, all at your fingertips. Auto scroll lets you quickly move through pages as you work out, and Interval training will let you set up and rest within the feature. Auto pause will pause then resume the timer based on your speed. The built in accelerometer calculates the distance as you work indoors. As the few mentioned features weren’t enough the 735TXT even provides you with Smart Notifications such as texts, emails and alerts when synced with a Smart phone. The extras just keep coming, this Forerunner has integrated Strava Live Suffer score which literally takes your heart rate during the workout, analyzes it then ranks it with a score so can push yourself harder to beat that score. The Garmin mobile connect app is a great way to share all of your accomplishments with friends and family as they cheer you on from anywhere. Don’t be bogged down by carrying a cell phone, get all you need right on your wrist, keeping information right where you need it most and still have your hands free. No matter what the sport, or activity let the Forerunner 735XT lead the way. 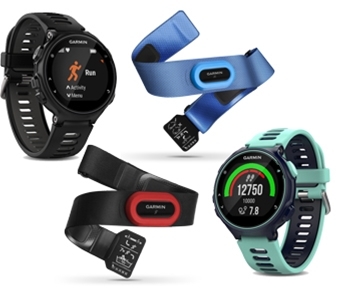 Each Garmin Forerunner 735XT comes with: Garmin Forerunner 735XT, Charging/Data Clip, HRM-Tri and HRM-Swim Monitors, Manual and a One-Year Warranty.